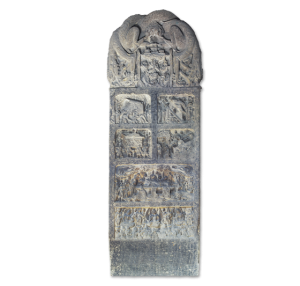 At 302 centimeters high, 97 centimeters wide, the tablet was originally engraved in 691 AD for Dayun Temple. The temple has been destroyed long time ago in the history. 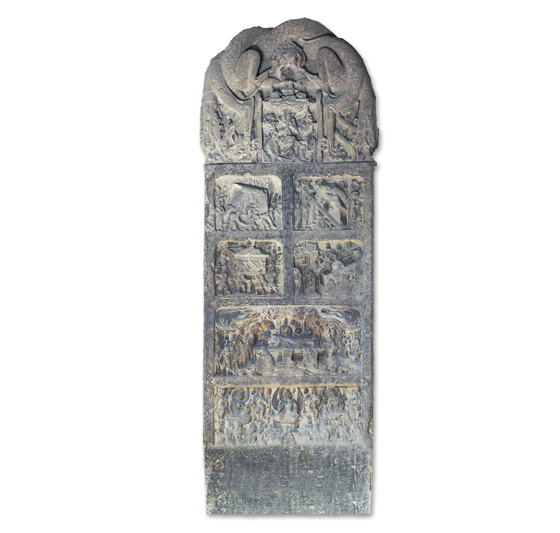 This stone tablet survived and was collected in 1957. Revolving around the key subject of Nirvana, there are six different stories like “Being Brought up in Nandas”, “Double Tree Nirvana”, “Expounding Buddhist Doctrine for Mother”, “Prophetic Vision by Way of the Double Feet”, “Funeral Procession”, “Burning of the Coffin” and “Emergence of Pagoda in Heaven”. In the lower part of the tablet are some names of benefactors. 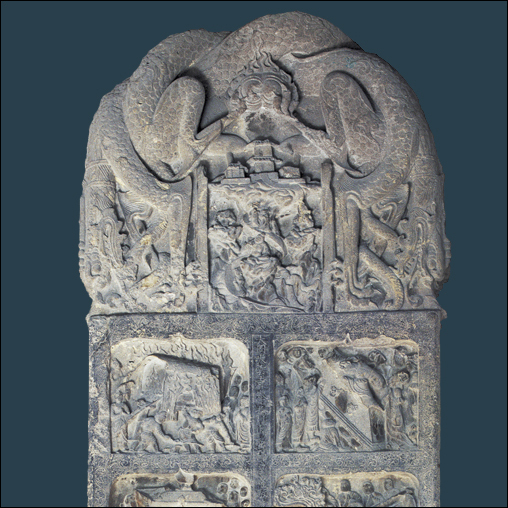 The middle part, decorated with relief sculpture, is of some higher artistic value due to its majestic scale, appropriate composition and exquisite carving. The unique historical position and natural environment of Shanxi has resulted in superb stone carving art. 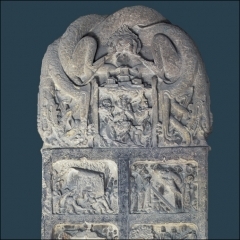 Since the Western Han Dynasty, the variety of stone carving works has been marvelous, locally distinct. 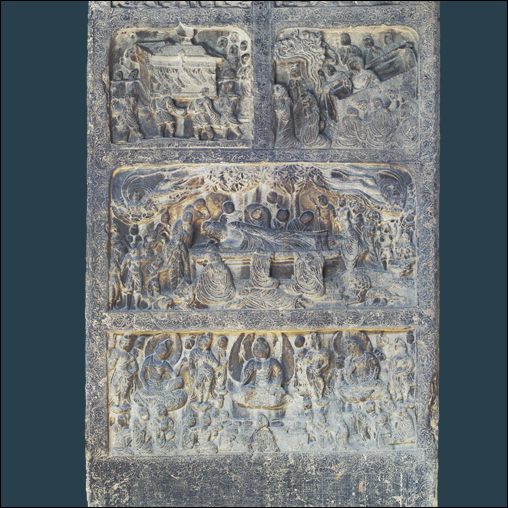 As to Buddhist picturing, Yungang and Tianlongshan Grottoes have gained fame home and abroad; with a great number of other statues standing in the countryside and ancient temples. 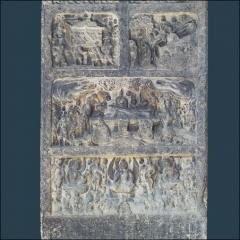 All the stone carvings and statues were found and unearthed in Taiyuan Huata and South Nieshui of Qinxian, and all the other places have made it possible for the restoration of the artistic nationalization since Yungang Time when its grottoes were coming into being and furthermore of the secularization in the Song and Yuan dynasties. The stone carvings and statues in the Tang Dynasty, graceful, robust and elegant, has created in anybody’s mind a longing sensation like “everything has been within me”. Just as religions are illusive, so too is art. This is the 24th of 64 culture heritages that the government of China forbids to exhibit abroad. The complete list is here. In Chinese.